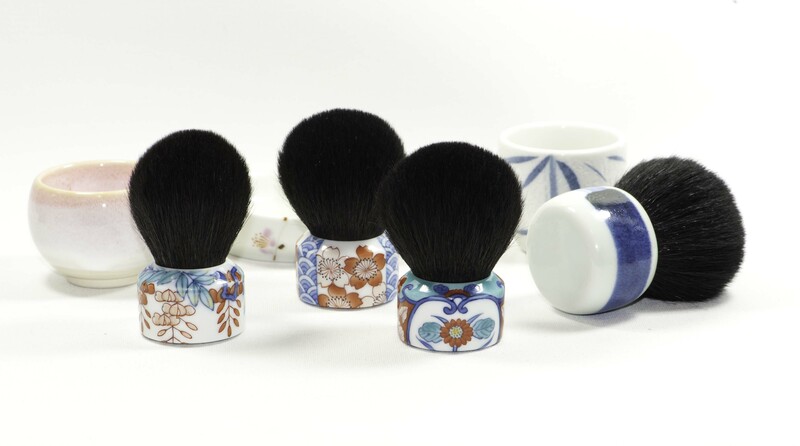 These Qusavi brushes are the result of a collaboration between Chikuhodo, for the bristles, and Qusavi for the porcelain handles. This porcelain is made in Arita (Japan) and is called “Imari” and each piece is carefully painted by highly-skilled master craftsmen. When you read about this porcelain, you mainly come across these three names: “Arita”, “Imari” and “Kilns”…. The first is the name of the town, the second the name of the historical trans-shipment port, and the third is the type of ovens where it’s prepared. These specific ovens were set up in the 17th century and the porcelain was extensively exported to Europe between the 17th and the 18th centuries. 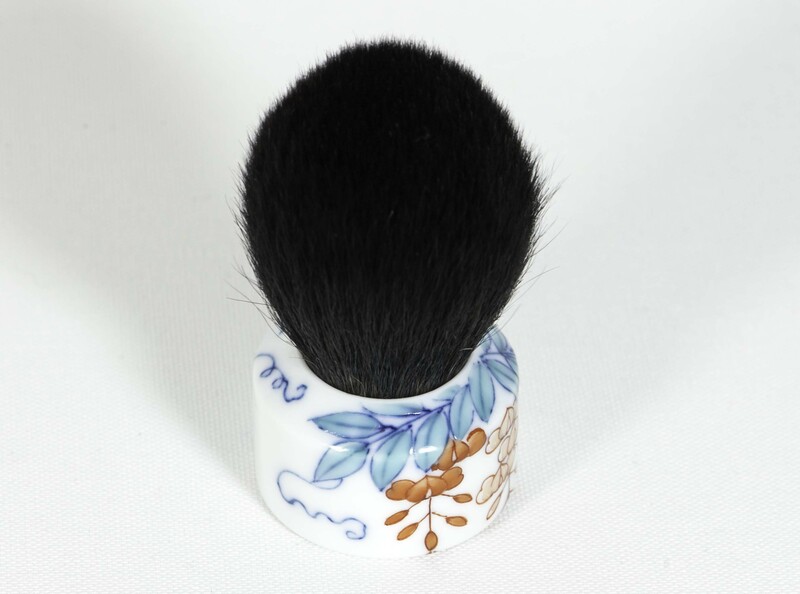 You probably heard about this Arita porcelain before, I didn’t, not really a fan of porcelain to be honest, until they had this crazy idea of combining porcelain and brushes, which captured my attention. My first thought was … what if they fall?? Chances are you are having the same thought right now. Breakage scares me but it doesn’t stop me. When I first heard about these brushes it was exactly 3 years ago when my quest was mainly about replacing my current brushes with softer options, the softest that were available, I had the impression these weren’t and that’s why I skipped them. Two years later, the softness factor was still a necessity but not my top priority and I started two new quests, one for functional brushes, the other for the joy of collecting special beautiful hand-crafted items. When three years ago I wasn’t ready for Qusavi, today I am. 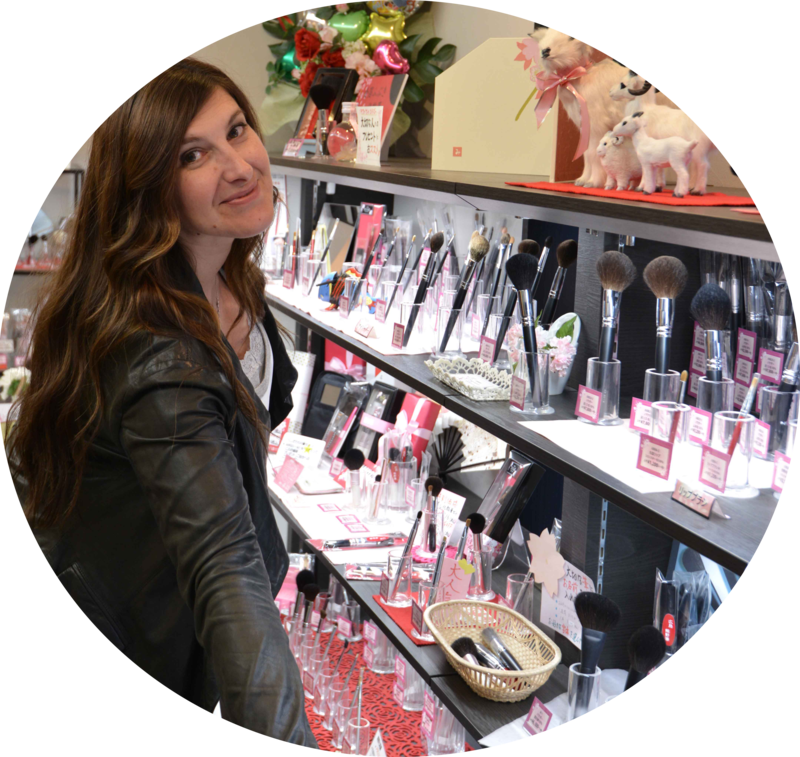 We evolve dynamically as we discover new brushes or new products and timing is everything. Aside from that, timing is dramatically linked to our wallet and these Qusavi can have a serious impact.. 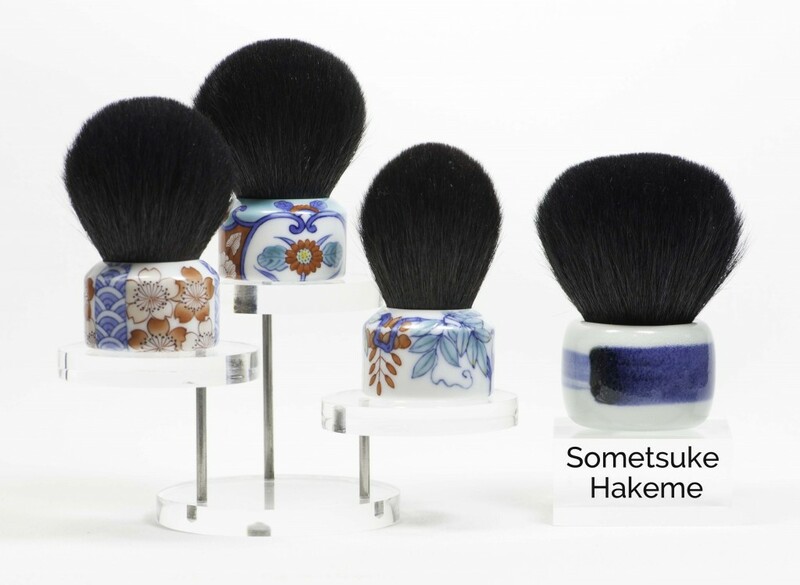 They are made with goat hair, this Sokoho hair feels like some Mac brushes if you are familiar with them, could be slightly softer or not, actually it will depend on what Mac brush you are comparing it to. We’ll address this later. Much softer than the Fukusen-gama series since there is squirrel in the mix, makes them more expensive but these are much more pleasant to use. Grooming brushes and I don’t own any today. The Sometsuke Hakeme, a present I received from my friends. As a little group they placed an order and for my birthday they sent me the big Sometsuke Hakeme, it felt so special that it was just a matter of time before I got two three more myself. When I think I am safe and I can stay away from temptation for a while and rest my wallet, some of you just push me right back into the damn rabbit hole! Please hop here for the official description of the brush on the Qusavi website. 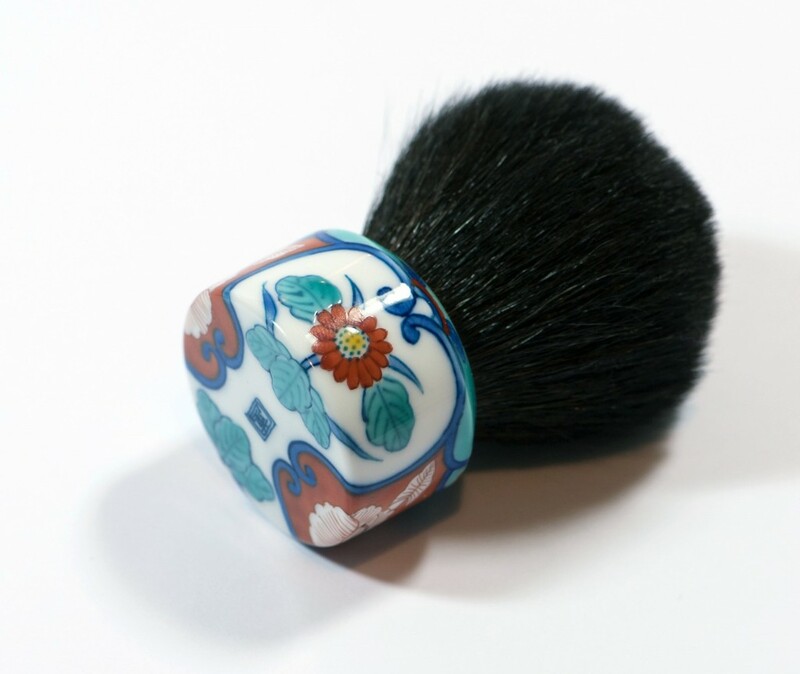 Each brush has a special meaning related to its design. This design means movement, dynamics, the porcelain shows tiny bubbles and a grainy texture that makes it really special to the touch. It feels very heavy so just keep that in mind. It’s not that soft but it’s still fine, not unpleasant to use although just in the borderline, just not the softest goat hair and I wish it was much softer, some days where my skin is feeling more sensitive, this is not a pleasant option. I do love the surface which is huge, 5cm to 5.5. It is dense but it’s not a mass of hair so the application remains effortless and versatile, providing you are not searching for precision. The other mixed brushes (squirrel/goat) are definitely softer than this 100% Sokoho goat, they are more expensive but the mix is making quite a difference. I am tempted to say that even if it would cost a little bit more, that I’ll rather prefer mixed bristles for all these brushes, or maybe just slightly softer goat bristles. Depending on your brush history or habits, the current goat bristles could be a little bit disappointing and, at the end, you may prefer to pay a little bit more and get something softer. I can still use it, I love it and enjoy it but I know some of you might expect something more luxurious in terms of bristle softness. I feel very close to this brush actually, not only because it’s a present but it feels special, that big heavy handle is fascinating me. This Sometsuke Hakeme is softer than the Mac 134 or the Mac 116, but the Mac 165 and 138 I own are definitely softer than this Qusavi. Each batch can slightly vary, I can just give you an idea of what you will get, but not an exact match. 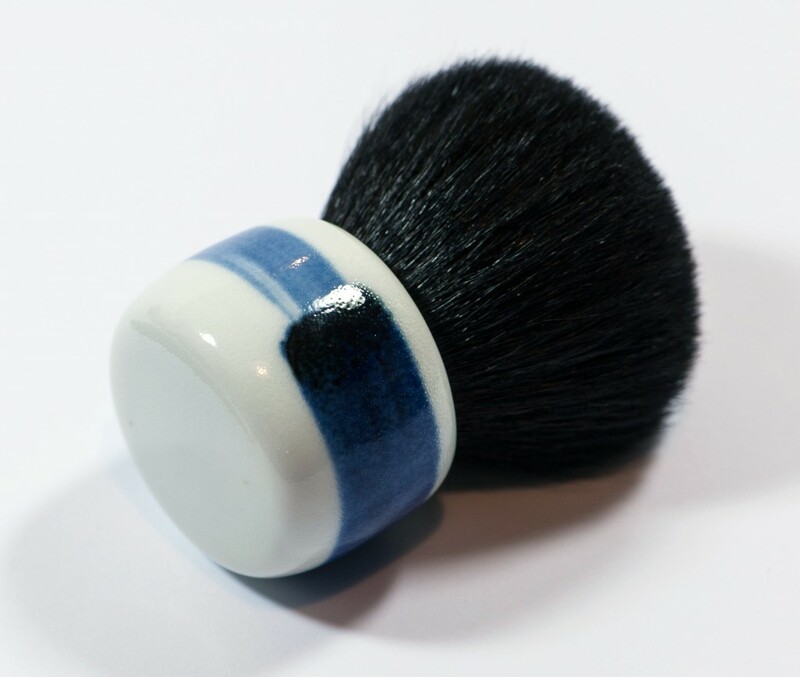 The particularity of this brush is the size, weight of the handle and the finish/texture of the porcelain. Below, on the left, the Hakuhodo Kokutan Kinoko Large C (Saikoho goat), softer and much denser, so dense that it almost feels like an sponge in comparison to the Qusavi. On the right the Chikuhodo Temari, also denser than the Qusavi and the softness is quite similar. 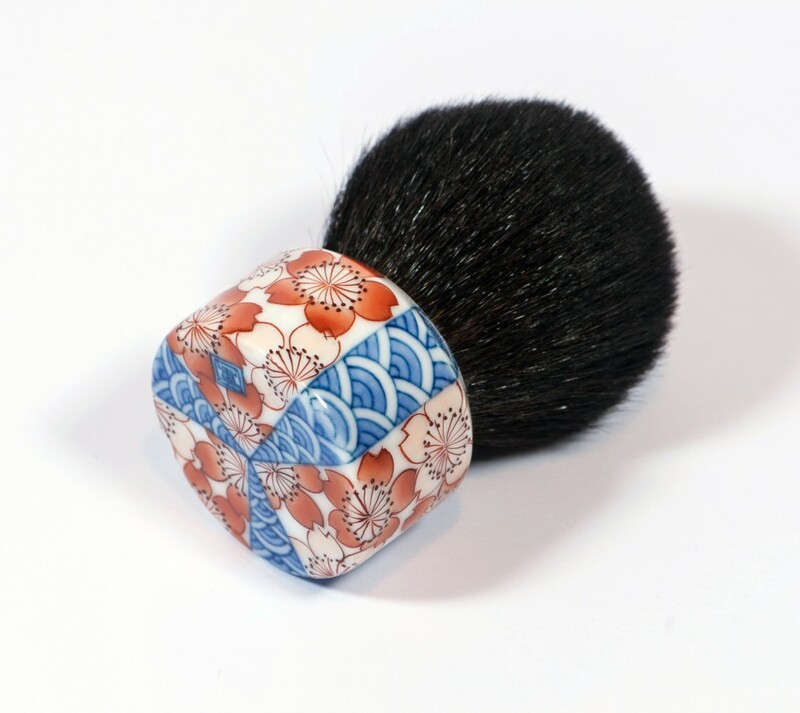 I use the Temari a lot either for finishing powder, powder foundation or to just apply a thin layer of powder foundation on top of my liquid application, but, I don’t use it when my skin is very sensitive. Please hop here for its official description. What I truly loved about it is the turquoise, actually the combination of colours is stunning, it draws my eyes to it from wherever I am, it makes such a statement. My favourite pattern of all the Qusavi handles, I love the detail of the flowers. Please hop here for the official description. If you are familiar with Japan and its gardens, you are familiar to Wisteria and via this design, it represents strength and vitality. I don’t think this is on purpose but this brush is softer than the other two which makes me use it more. Some of these porcelain paintings are flat but the Fujie and the Ko have leaves or flowers that feel a bit embossed, or partially embossed, it just gives the paintings some dimension and that is a big plus for me. If you love Sakura patterns you will be so in love with this handle. 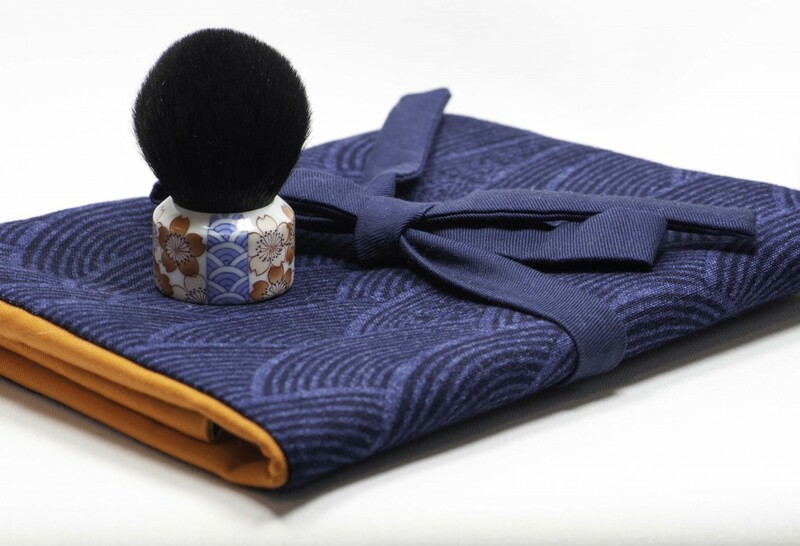 On top of that, it’s combined with a Seigai pattern, it’s an ode to Japan. I could not skip this, period. 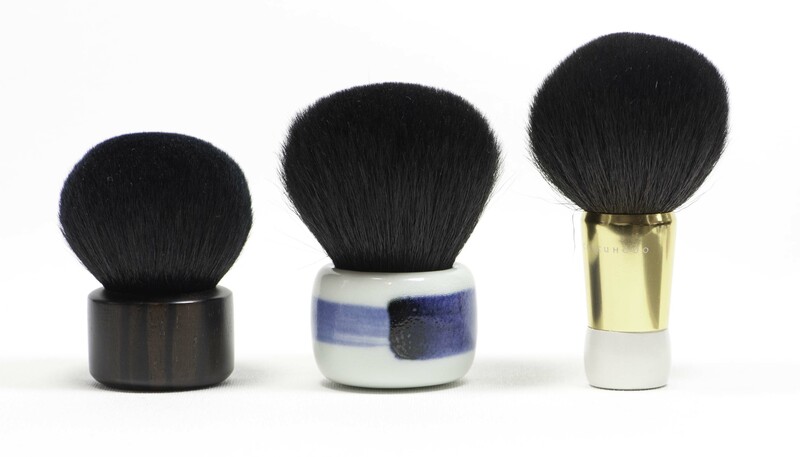 These three Qusavi brushes are of same materials, mix of goat and squirrel, they feel quite similar to the touch. The Fujie feels a bit softer, almost like there is less goat and more squirrel but with mixes you may get some difference from one batch to the other. The Koyudo H008 in this pic is also a mix of goat/squirrel, it feels quite similar to the Fujie which is the softest of the Qusavi. The Koyudo is denser and allows a heavier coverage and more precision, it’s firmer and shorter. When I took this picture below, I still did not had the Fujie as it was out of stock so I contacted Qusavi and after a few weeks it was back and I could get it. They come in little cardboard boxes that I use to store them when I put them inside my drawers. Very handy so that they don’t move around but they are never in the drawer anyway. We all have our own reasons and mechanisms that trigger the cart button and our reasons change on a regular basis. I got these Qusavi because they are beautiful to look at, because of the traditional history behind, they have to be treated with care and respect, store them in a safe place if you can. 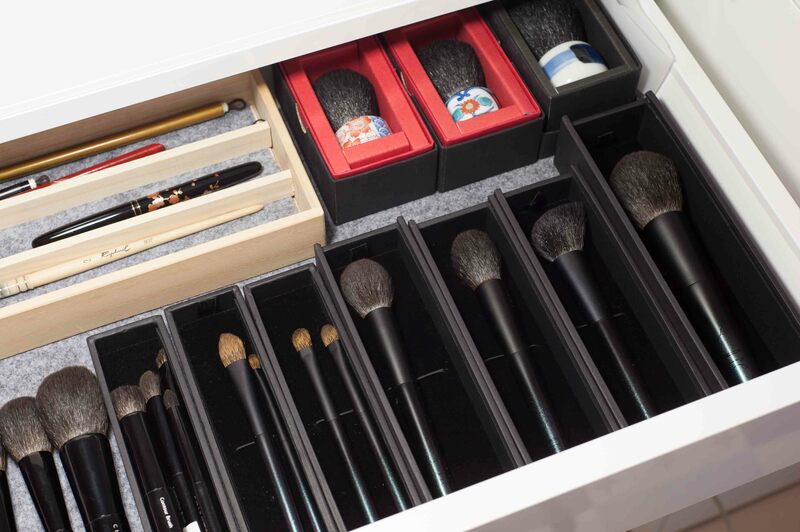 Today the brushes are either on my vanity when I use them, stored in the display cabinet or in a drawer. On the vanity they look amazing and even though they have their own place reserved in the drawers, they are always where I can see them. I am fascinated with the Qusavi because they are different, not ordinary, it brings make-up to another level, weird, fun and grown-up. They require careful handling but it’s so worth it. There is just one thing that concerns me, I got them a few months ago but I haven’t used them in winter yet, I believe that I will very much prefer the feeling of wooden handles than porcelain in colder days, I have heating but still, it is cold here. Time will tell, snow is just around the mountain. Qusavi own the JPAP website (“Japanese Porcelain and Pottery Club”) where they sell porcelain and those brushes, I got mine there. Today they range from 120usd to 460usd approx. QUSAVI BRUSHES was last modified: October 20th, 2015 by Sonia G.
Beautiful. Work of art. 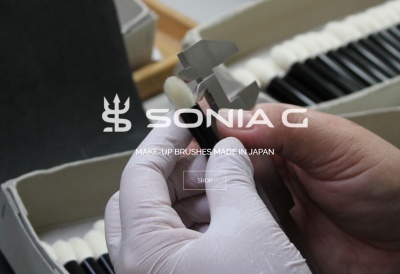 Sonia, you should have a museum for us to see all your brushes. Thanks for sharing. Did you get any yet? Que bonitos son todos, algunos esta bien de precios , otros no veas que caros jooo …. haber cual compro ja ja ja. dime cuales te gustan 🙂 los mas caros ? I have a special love to these brushes. I was going to sell them in our Kohlindo shop just before we closed it. So I had the luck to have them for a while. I read about them then and again I was so impressed about the handcraft. In these brushes you get two different kinds of handcraft. I have a passion for the Japanese handcraft Its worth every yen! Hi Malin, they are insanely beautiful! When you love traditions and Japan these are a must have, indeed two different kinds of handcraft, I can’t stop looking at them 🙂 I imagine that knowing you and your love for traditions, these would have been the stars in your shop! Great review and pictures! I have mine under a glass dome beside my vanity, so I can stare at them every time I do my makeup. Love the craftmenship, but my skin is to delicate to use them. I wish they would have softer bristles, too. And in my dreams there are a brush with the surratt cheek head and a porcelaine handle like a bigger louboutin lipstick… pure white porcelaine but with the riffles from the lipstick tube…. Thank you , Sonia, for this wonderful review! 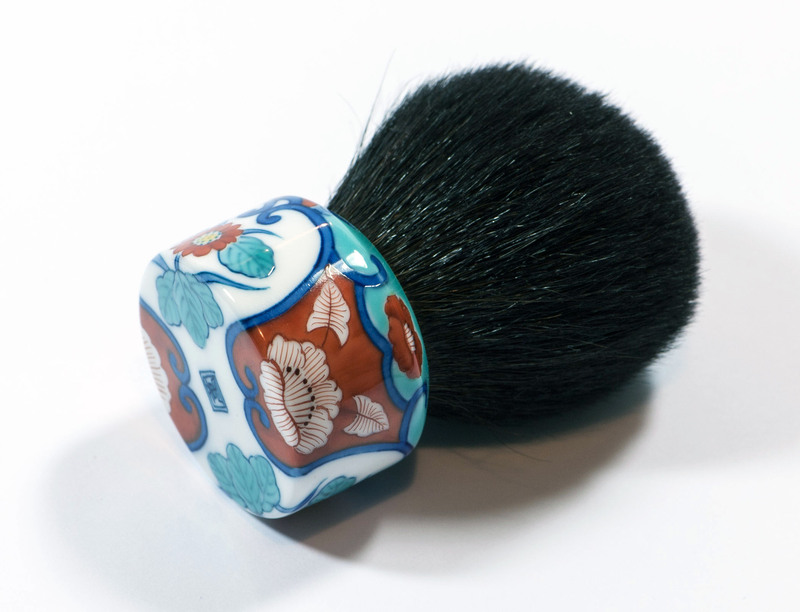 I have the Sometsuke Hakeme like yours, and the Kodemari brush. I just adore them- mine live in their little boxes, since my make station is at the moment in a tiled bathroom. I find that the slight extra firmness of the Hakeme makes it ideal for Guerlain Meteorites (I find that the softest of the soft brushes don’t pick up very much power from the beads). I would love to collect all of these brushes. They are just too beautiful. 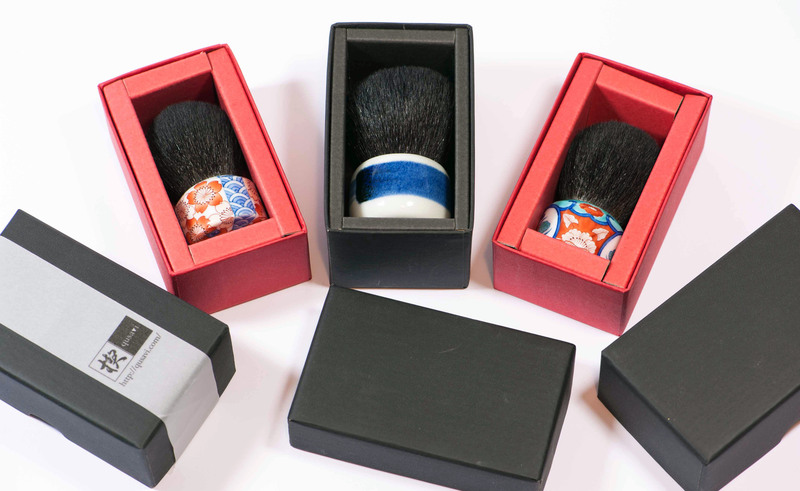 I’m interested in the shaving brushes, mainly because they are so beautiful. However, I have had laser hair removal, so I have no need to shave any more! Do you think badger brushes would be useful for another purpose? Such as for face washing, exfoliating, or perhaps makeup application? I’ve never used one, so have no idea if they are multi-use. Again, thank you for the wonderful review and the wonderful photos. I hope we can both collect more of these brushes! oh Megan, I see you got the Qusavi bug 😀 me too I would love to collect all of them, that will certainly take some time though… totally agree about the softness and the efficiency that some powders require, sometimes it’s great to compromise a bit on softness to get a better functionality.